We must confess that pork is one of our favorite meats. We love its rich dense flavor and firm texture. And the right cut, properly cooked, is as tender as a good steak. Pork also has an affinity for sweet flavors and fruit in particular. In this recipe medallions of pork tenderloin are quickly sautéed. Then a pan sauce is made combining apples, cream, and Calvados, a French apple brandy. This is easy enough for a weeknight meal, but worth saving for a special occasion. We like this dish with steamed, buttered cabbage. Season pork medallions generously with salt and pepper. Heat oil in a medium skillet (not non-stick) over medium heat. Add pork and cook on each side until browned, about three minutes per side. Place medallions on a plate in the oven. Melt butter in skillet. Add shallots, apples, sage, and rosemary and saute until browned. Add Calvados and chicken stock and deglaze the pan. Reduce liquid by 1/3. Add cream and reduce to desired consistency. 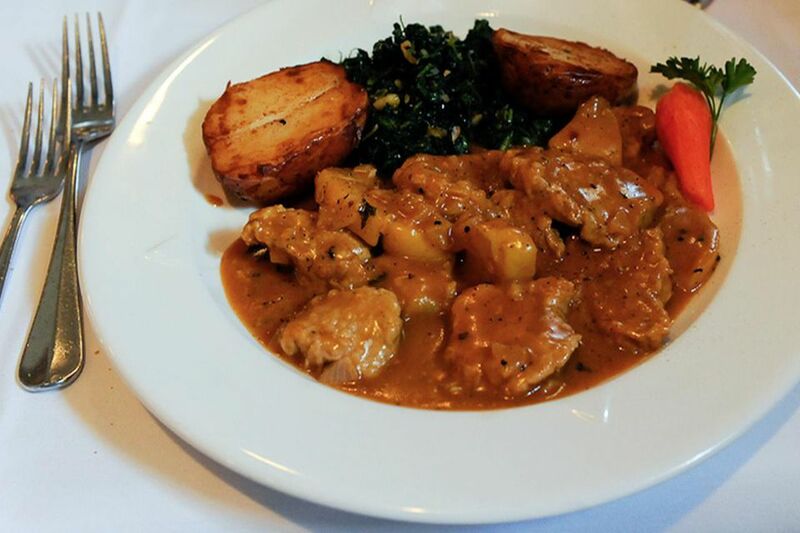 Divide pork between plates and spoon apples and sauce over the top. Crab Cakes for Two: Easy to Make, and Is a Perfect Weeknight Meal!